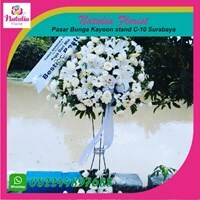 We Natalia Florist center of the bungan shop in Surabaya sell standing flowers with various models and sizes ranging from the smallest to the largest size we sell at low prices with the best quality and service. 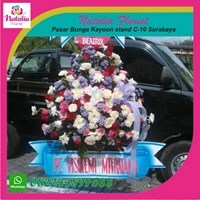 We also serve online sale / purchase of flowers, for further information can contact us through our contact. Flower StandingFlower standing is one type of table flower arrangement (table flower). What distinguishes is the leverage media used. If the flower table (table flower) is used as a lever vase (media for meletakka), but if for the standing flower (standing flower), used standing rack (frame leverage) which is positioned higher than the vase.Flower decorating boards is a flower arrangement that is stacked on the board. Flower board is widely used for certain occasions as a greeting or greeting. Compiled by a professional workforce and qualified so that has a high artistic value. 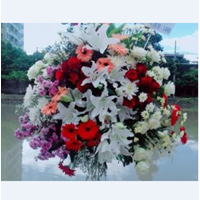 We also provide various kinds of Decorative Flowers and other wreaths on request. Flower Standing DecorationFlower standing is one type of table flower arrangement (table flower). What distinguishes is the leverage media used. If the flower table (table flower) is used as a lever vase (media for meletakka), but if for the standing flower (standing flower), used standing rack (frame leverage) which is positioned higher than the vase.Flower decorating boards is a flower arrangement that is stacked on the board. Flower board is widely used for certain occasions as a greeting or greeting. Compiled by a professional workforce and qualified so that has a high artistic value. 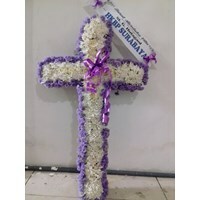 We also provide various kinds of Decorative Flowers and other wreaths on request. The flower of the cross is a symbol of the belief of the Christians, as the Flower of Grief, for the purposes of decorating the lid's sorrow and expressing a feeling of grief over the death of someone both to relations, friends to relatives themselves. It is a cross-shaped flower arrangement that is designed with a variety of flowers and is complemented by other materials or ornaments. The flower of the cross can represent you to express your participation in the pain felt by the family concerned. In addition, it is also a sign of your concern for the deceased. Use large white plant plants to fill the center of the cross. Add a couple of colorful focus flowers in the middle of the cross that the two arms meet. Don't forget to soak the floral foam and keep the quality and wet so that the flora is no longer dehydrated. For Catholic Christians as well as Protestants and Christians, using the standing flower of the cross when a family dies is an obligation and also a necessity, because this method is a way that has been set and is a rule that must be obeyed by all Christians and also Christians. The standing of the cross or the flower of the cross is always used to be placed on the coffin and used for the funeral procession of Christians and Christians. So it's no wonder if the cross's flower standing is always sought in various flower shops when someone dies. 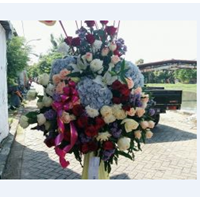 Buat Permintaan Untuk "Standing Flower"
Standing interestA ragkaian consisting of beautiful flowers and beautiful colors.Standing flower is one type of fresh flower arrangement that is quite popular and in demand, not only as an ornamental flower, but also to be given as a congratulation. Indeed the flower standing with a variety of colorful flowers adds to the lively day.Grief Standing FlowersThis Standing flower is arranged using a type of flower with several choices of calm colors, such as white, yellow, and purple, plus a number of appendages such as leaves, ribbons, and greeting paper.Standing Flowers for Marriage (Happy Wedding Standing Flower)The type of flower used is a flower that has bright colors. These fresh flowers can be arranged with fresh stalks and leaves as well. Then given a standing made of iron.Interest Standing for Company Endorsement, shop (Congratulations)used for important events such as company authorization, which are usually also attended by several important people. This standing flower uses several types of flowers, both roses, tulips, lilies, and can also use orchids, baby breath. After that you can also add a message written on the big ribbon looped on the standing flower with the message of the company name, then greeting success.While the standing flower of congratulations is a kind of fresh flower arrangement that resembles a table flower arrangement, only the difference is the supporting media used. If the table flower arrangement uses a vase as a support, then the standing flower uses a standing shelf that is positioned higher than the vase.